some dogs are black and white. Dog Training rarely is. We Specialize in finding what works for you and your dog. Every dog, like every person, is unique. Cookie cutter training programs and large group classes cannot provide the personal approach needed to get the results most people seek. Building a positive relationship with your dog requires an insightful trainer, customized training program and practical approach that takes the individuality on both ends of the leash into account and helps you create a two-of-a-kind relationship that works. Ready to take your dog's training to the next level? Want to know what Optimist Dog Training can do for you and your dog? Check out the services we offer. 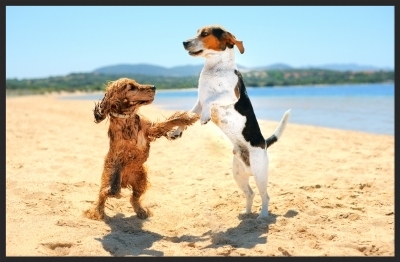 Why are these dogs dancing? Find out why past clients (and their dogs!) are so happy with Optimist Dog Training service and results.